The third in a series of video clips featuring a track-by-track breakdown of "Tibi Et Igni" (a Latin phrase which translates to "For You And Fire"), the new album from Polish death metal veterans VADER, can be seen below. Due on May 30 via Nuclear Blast, the follow-up to 2011's "Welcome To The Morbid Reich" was recorded at Hertz Studio in Bialystok, Poland with producers Wojtek and Slawek Wiesawski. The artwork was handled this time by a true legend of visuals, Joe Petagno (MOTÖRHEAD). Commented VADER mainman Piotr "Peter" Wiwczarek: "Joe is a legend! Not just because he created MOTÖRHEAD logo or breathtaking artworks for many outstanding albums. Joe is over all times and his imagination touches the Hell itself…. And this is enough reason to ask him for painting 'a Hellfire' for VADER's new music. He accepted it and… made me so proud!" Joe Petagno added: "They have been on my 'get in touch' list for years. Finally we managed it and for a killer album very appropriately titled: 'Tibi Et Igni'." "Tibi Et Igni" will be made available as a standard jewelcase CD, digipak (with 2 bonus tracks), as colored vinyl with a bonus seven-inch EP (including 2 bonus tracks) and exclusively at Nuclear Blast mailorder as a limited digipak edition with a signed VADER tourbook. Side A: "Where Angels Weep"
Side B: "Triumph Of Death"
The song "Where Angels Weep" was also made available digitally. The vinyl and the digital version were released on April 18 via Nuclear Blast. VADER's forthcoming effort will mark the recording debut of British drummer James Stewart (DIVINE CHAOS), who replaced Pawel "Paul" Jaroszewicz in 2011. 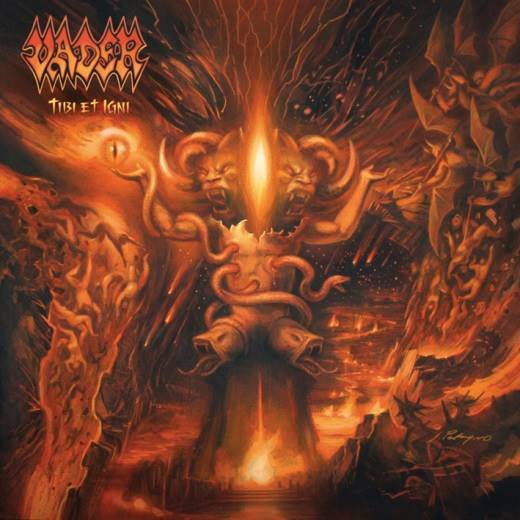 VADER's latest album, "Welcome To The Morbid Reich", was released in Europe on August 12, 2011 and in North America on September 13, 2011 via Nuclear Blast Records. The effort was recorded at Hertz Studio in Bialystok, Poland and features the cover artwork of Zbigniew Bielak (DESTRÖYER 666, WATAIN). The band laid down a total of 12 songs for the CD, which was mixed and mastered in May 2011.